People often want to know the secret of how to close more business. Who wouldn’t want to increase their sales this year? It’s rare to find someone who doesn’t need any more business. Even when you have a full client load, you still should be prospecting. The fact of the matter is clients leave eventually. The reason for leaving is often something outside of your control. When you find yourself in a situation where you need be selling, are you prepared? Do you have the skills required to be effective? If not, what are you willing to do to get the skills you need? And, more importantly, how much business are you willing to lose before you take action and seek support? I recently came across a study that showed people who have selling skills are able to close business after 5 client contacts compared to people without selling skills. It takes everyone else 8 contacts with a prospect before they’re able to close business. That’s a 37.5% shorter close time for people who’ve learned the art of selling. What this study doesn’t point out is that most entrepreneurs would never make it to the 8th touch point with a prospect. They’d give up long before that. When is the last time you strategically connected with a prospect more than 5 times in order to earn their business? And I don’t mean sending someone 8 emails or leaving them 8 voicemails. There’s not a lot of strategy in sending out/leaving generic messages. Last week a client shared with me how after just one coaching session she has closed $7500 in new business. She’s so excited about her new selling skills she’s telling all of her colleagues about it. One of her friends is struggling to close business. My client encouraged her to contact me. Her friend’s response is that she’s already investing $2500 a month in another business coaching program and she can’t afford it. However, the other coaching program is teaching her general business skills, not selling skills. This woman’s packages are $10,000 a piece. She only needs to sell 1 package to recoup her investment in learning selling skills. Yet, she’s unable to wrap her head around making the investment in herself and her business. It’s common for people to think investing in business skills is the same as investing in selling skills, it isn’t. When you’re not feeling well, you go see a regular physician. If they can prescribe something to help you, they do. However, often times, they refer you to a specialist to solve your problem. It’s the specialist that is going to figure out what’s wrong and give you a course of treatment. Another client reached out to me this week to give an update on her results. She did a strategy session with a well-known business coach about a sales opportunity she had coming up. The business coach gave her some great general advice. However, she hired me to teach her techniques and skills to move someone through the selling process. She needed specific language, sales strategy, and ideas of what to do in the meeting to secure the deal. We spent quite a bit of time working on what she needed to prepare before the meeting, the exact language she needed to use in the meeting based on what she knew about the prospect, and how to move the opportunity to the next step before leaving the meeting. I was also able to give her contacts to source materials should the prospect give her the go-ahead on the project. This one opportunity could potentially double her sales this year. At the end of the meeting, the prospect was so impressed, she told my client that if all goes well, she has seven more projects in the works that are as big as this one. There is nothing quite so rewarding as repeat business. Being able to close business is something absolutely every entrepreneur should be able to do. Yet so few actually invest time or money in learning how to do it well. The amount of money people spend on marketing, backend support for their business and a myriad of other expenses is a complete waste of money if you can’t close the leads coming your way. Take action now and learn what’s missing in your sales process. Sometimes it’s the smallest adjustments that will allow for you to increase your effectiveness. 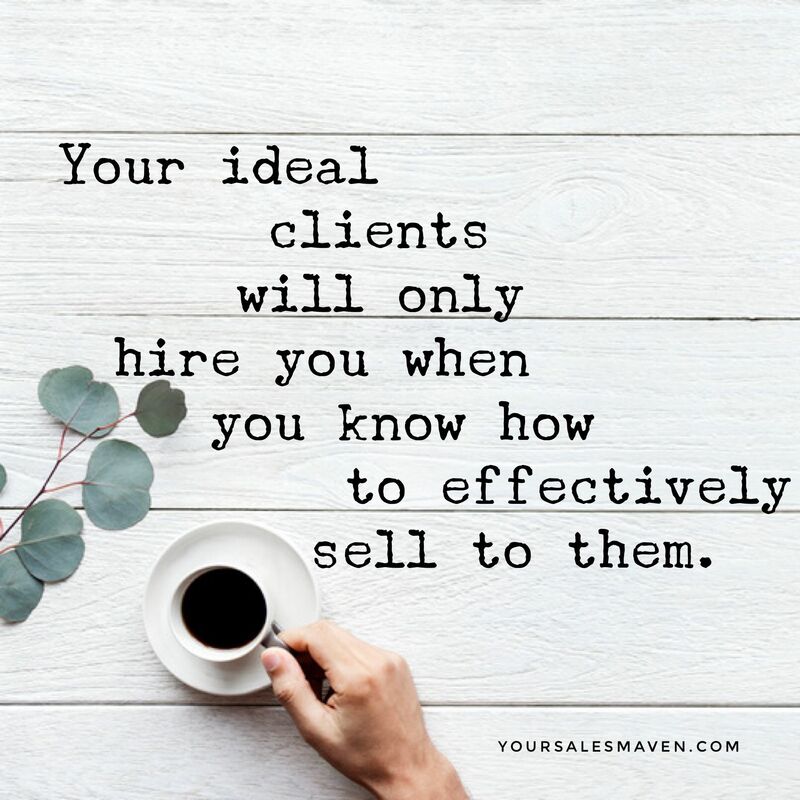 So many ideal clients are waiting to hire you. Until you know how to engage them and walk them through the sales process, they are missing out on how you’ll help them improve their lives and businesses. Wishing you continued success in closing more business.